For the past 30 years little readers have been swishy-swashing and splash-sploshing, walking through wavy grass and squelching through mud – they can’t go over it and they can’t go under it – they always have to face the hard stuff, that is if they want to catch a bear! So many of us have read We’re Going on a Bear Hunt, the book by Michael Rosen, illustrated by Helen Oxenbury, perhaps the question should be, who hasn’t been on a Bear Hunt? It’s a book that has certainly stood the test of time, a classic read-a-loud book that has graced the shelves of every library and found a permanent place in the hearts and homes where little readers reside. It all started in 1977 when Scottish folk singer Alison McMorland asked illustrator Helen Oxenbury to design an album cover for her collection of traditional children’s songs. Among the old songs in this collection was one called We’re Going on a Bear Hunt. And as many of you know, the story was about five young hunters and their dog who overcome many obstacles in order to find a bear and when they do eventually find the bear, are so alarmed, they run back through all the obstacles all the way home to hide under the bed covers! Poet and performer Michael Rosen came across the song about the same time and incorporated it into a one man show that he was taking to British school children. When Rosen’s publisher saw the show, he convinced him that the story should be written down and Helen Oxenbury should illustrate it and the rest is history. Little did they know that 30 years later (and never out of print) parents the world over would still be sharing this wonderful read-a-loud story with their children. The repetitive rhyming and sing-song beat, combined with stunning water colour paintings (for the action scenes) and line drawings (for when they are considering the problem) bring the story vividly to life. Watch Michael Rosen acting the story out here it’s irresistible! Helen Oxenbury drew on the landscape that was dear to her heart as inspiration for the illustrations. Some capture her home surrounds, and some are inspired by holidays and childhood jaunts. She particularly wanted to epitomise the freedom of being young and looking for adventure. We’re Going on a Bear Hunt also highlights the importance of imagination, encouraging children to act out and put their own mark on the story. This is a classic story time book not to be missed, one to be acted out, sung, shouted and to be read over and over again. 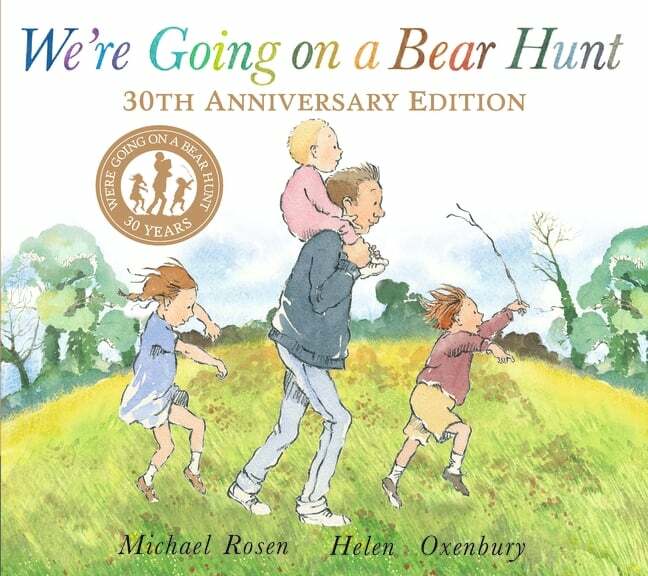 It’s also one to reminisce with, so if you have an old copy of We’re Going on a Bear Hunt that you read to your children or grandchildren, or one that was read to you, why not celebrate the anniversary by making yourself a cup of tea and putting your feet up and remembering all that tiptoeing, stumbling and splashing? Even better, make the time to cuddle up and share it with a little person in your life. Walker Books celebrates 30 Years of We’re Going on a Bear Hunt by giving one lucky reader a whole year of story-times. 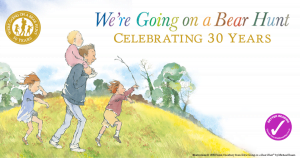 To mark the 30th anniversary of We’re Going on a Bear Hunt, Walker Books are running the following amazing competition. Sharing story-time with your child is special. For 30 years, families have been reading We’re Going on A Bear Hunt and we want to celebrate by giving one lucky reader a whole YEAR of story-times! To enter, all you have to do is upload an image or a video of you and your family sharing We’re Going on a Bear Hunt to Facebook, Instagram or Twitter using the hashtag #happybirthdaybearhunt and tell us what you think makes We’re Going on a Bear Hunt special! We’ll be sharing our favourites throughout March, and the most original and creative entry will win 52 free books tailored to the kids in their family! So what are you waiting for? Come join us on the Bear Hunt! Visit the website for further details and enter here. So I hope this makes it into your competition.